A food truck serving the Filipino version of tacos, burritos and fries smothered in nacho-like toppings will return to the corner of 18th and Valencia. 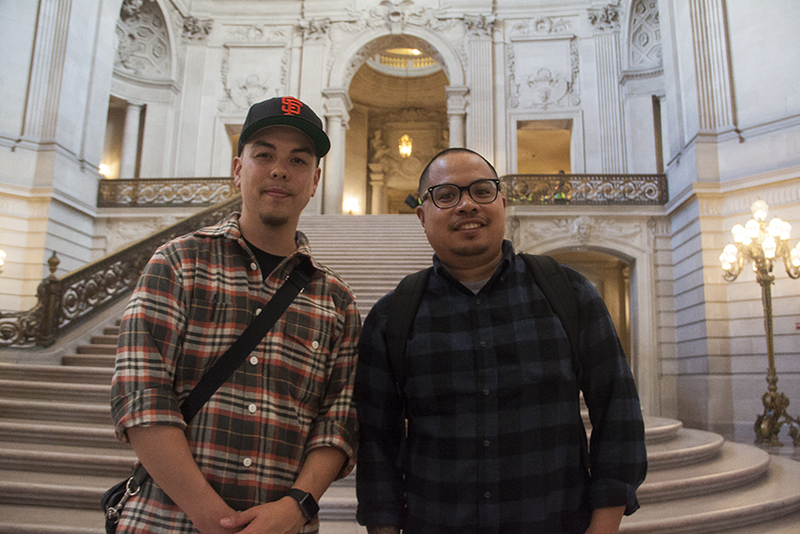 In a unanimous vote on Tuesday, city supervisors reversed a ruling by the San Francisco Planning Commission to ban food sales on the corner where Señor Sisig had operated for a year, until their permit was rescinded in March. Now, it’s back to normal for Señor Sisig owners Gil Payumo, Evan Kidera and the lot operator, Ryen Motzek, who leases the lot from nearby Cherin’s Appliance. Payumo said they had no clear date on when the truck will be back, but it will arrive with a one-year permit to operate a truck and camouflaged restrooms. 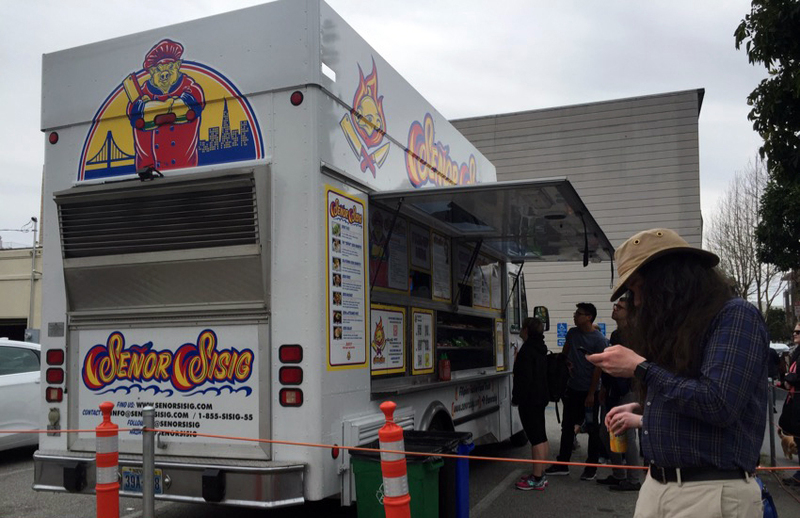 During this year, Ronen said, the city will study what impacts food trucks have on the area. The entire fiasco began in March when the owners tried to go bigger and add more trucks, alcohol sales and outdoor seating. Motzek expected the process — known as getting a conditional use permit — to be a breeze. Instead of picking up a permit, as he had done on many occasions for his vehicle-parking business, Motzek wound up in front of a public hearing filled with angry residents. “I didn’t know the deal. It was my first time at a commission hearing ever, I had no understanding of the process,” Motzek said. That might have helped. Few liked his idea and most told the planning commissioners that adding more food trucks and selling alcohol on the lot would create too much noise and draw customers away from nearby restaurants like Taqueria Buen Sabor and Regalito. The commissioners sided with the neighborhood. Motzek, who has been leasing the lot on Valencia street since 2006, said the intention was to help other food-truck operators and make use of the parking lot rather than create a party atmosphere on the street. “There was never an intention to turn it into a beer garden. That’s not the kind of neighbor I am,” Motzek said. Flash-forward to Tuesday and the more than 20 people who spoke in support of Señor Sisig’s return to 701 Valencia, each taking two minutes to voice their praise for the food truck. “I can’t really think of another Filipino food option that I would want to eat,” one supporter said. “This is not competition for the local merchants. The food that Señor Sisig offers might sound the same, but it’s completely different. You’ve heard folks say that it is unique, and I agree,” another supporter said. Evan Kidera, left, with Gil Payumo, right. Both co-own Señor Sisig food truck company. Photo by Abraham Rodriguez. Ten others who attended Tuesday’s board meeting opposed the truck, citing noise levels, large crowds, alcohol sales and the lack of bathrooms. “One cannot say with a straight face they support local brick-and-mortar restaurants in the mission and then proceed to place a food truck operation within feet of two existing restaurants and then allow added expansion of hours and communal seating,” an opponent said. Ronen wasn’t happy with the tenor of the disagreement. “I am disturbed that the situation has devolved into a fight that pits small businesses, both owned by people of color, against one another,” Ronen said. The supervisor’s support came after it became clear that the permit allowed only one food truck and would be valid for one year. In turn, the lot will not have seating or amplified sound and provide camouflaged restrooms. Without any opposition on the Board of Supervisors, the amendment passed. Kidera, who was born at St. Luke’s hospital and grew up around the restaurant his father owned near Valencia and Market, said he was relieved — happy to return to what he knows best. “It’s really just about getting the staff back there and making sure we do everything right,” Kidera said. Planning Commission should be abolished.. What a waste of time.